As the leader of the greeting card industry, Hallmark leaves its mark on more than just cards. Donald J. Hall, Jr. and David E. Hall, both grandsons of the founder, continue the legacy of strong family leadership and innovation. Don steers the company as CEO, while Dave leads as president, both overseeing the corporate portfolio of businesses. 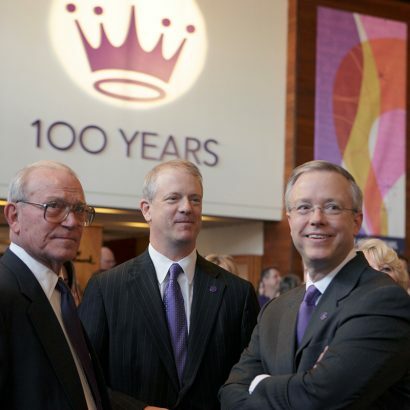 Pictured at right, celebrating the company’s 100th anniversary (from left) are Donald J. Hall, David E. Hall, and Donald J. Hall, Jr. In its second century, the Hallmark brand continues to evolve across its portfolio of businesses. Quality family entertainment started with the Hallmark Hall of Fame and lives on with the Hallmark Channel and Hallmark Movies & Mysteries cable television networks that reach millions of households with family-oriented programming. Our Crayola subsidiary continues to inspire children’s creativity through Crayola crayons and markers as well as other innovative art tools, crafting activities and creative toys. On the greeting card front, Hallmark continues to transform the industry with lines like Signature, Studio Ink and Mahogany. Innovative products like Recordable Storybooks and itty bittys® plush characters create shared connections to treasure between grandparents, parents and children. Today, Hallmark gift products can also be found at tens of thousands of retail outlets worldwide and online at Hallmark.com. The company publishes in 30 languages, and its products are available in more than 100 countries around the globe. Hallmark Gold Crown® stores, the company’s network of independently-owned card and gift specialty stores, bring the most extensive selection of Hallmark products to your neighborhood and Crown Center continues to be an exciting place to work, live and play. We’ve come a long way from a man with empty pockets, two shoeboxes of postcards, and a dream. But most importantly, we’ve held onto the enduring beliefs and values that fill the basic human need to connect with others.